AD Piston Ring manufactures an oil control piston ring. It is a ventilated oil control ring with drains through the face of the ring and the back of groove. It is an excellent motor ring or seal. Oil control rings and seals are used in light-vehicle gasoline engines and truck diesel engines. The main function of the ring in the bottom piston groove is to scrape oil from the cylinder wall, meaning oil-control rings play a major part in regulating an engine’s oil consumption. Oil control piston rings and seals are used in conjunction with other rings or as stand-alone applications. 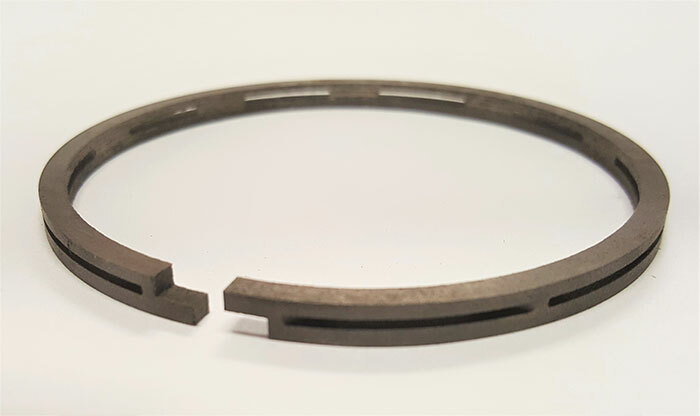 Oil control piston rings can be made of cast iron and bronze aluminum materials. Step cut oil piston rings are available in 2 inches to 30 inches.